Each year at the JFCS Holocaust Center, students from colleges and universities throughout the Bay Area apply for the University Fellowship. As part of this program, two students benefit from a nine-month intensive study of the Holocaust that includes mentoring and teaching high school students, developing curriculum, working with primary source materials in the Tauber Holocaust Library and Archives, and gaining first-hand experience learning from Holocaust survivors. Upon completion, fellows are granted a stipend of $5,000 and course credit where applicable. This past year, one student from University of San Francisco and one student from San Francisco State University joined the JFCS Holocaust Center staff as the Albert Jerassy and Lilly Manovill University Fellows. 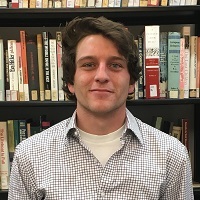 Zach Kopowski served as a Teaching Assistant for the Manovill Holocaust History Fellowship and Grant Evans served as a Teaching Assistant for the Next Chapter. Both of the 2017-2018 University Fellows brought a wealth of knowledge and experiences that enhanced the work of the Holocaust Center over the course of their fellowship. For me, this fellowship has been the opportunity of a lifetime. 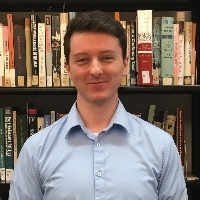 My passion for history, and the support of Professor Millet at San Francisco State University, led to me take the leap and apply for what I assumed would be the chance to not only put my historical skills to the test, but to begin to cultivate myself in a professional environment while I was still in school. What I did not realize is that the fellowship would do all of this and so much more. Less than a year ago, when I was jumping around ecstatically after reading that I had been accepted as fellow, I could not have even dreamed about the experiences I would have over the next few months. It has truly been a life-changing journey with so many wonderful moments that I will never forget. There is no way I can fully convey the role of a fellow at the Holocaust Center in a short amount of time. As a fellow you are an educator, an archivist, a researcher, and so much more. If you have a love of history, you will learn things that very few undergraduate college programs can teach you. If you are an advocate for human rights, you will have a chance to make a true difference in the world. If you want to be a teacher, you will develop lesson plans, teach classes, and work with students the entire time you are a fellow. All of these things made me absolutely love being a fellow, but they are some of the things you would expect going in to the fellowship. However, many of my favorite moments happened when I was not fulfilling any of the roles I mentioned. They came when I least expected them to. I would like to share a moment here, even if it is purely for the reason of writing an account of it. My favorite moment, perhaps the best memory of my entire life so far, came quite early on in the fellowship. A group of Holocaust survivors who regularly enjoy brunch with each other had their weekly get-together at the Holocaust Center. One of the activities that was planned for the brunch was to sing some traditional Yiddish music. The light in the eyes of the survivors as they remembered and started singing songs they learned as children, passed down to them by previous generations, was brilliant. It took a few choruses each time, but eventually I could hum the melody and catch a few words in between. I like to think that in this moment my eyes lit up like the survivors’, but in pure disbelief of what I was a part of. My time in the fellowship was full of moments like these. I will forever cherish the incredibly memories I made from the unique experiences that I was lucky enough have. I am so thankful for this fellowship, and I am forever indebted to the Holocaust Center for giving me this opportunity. I was initially hesitant about accepting the University Fellowship at the JFCS Holocaust Center, as I am a specialist in neither European History nor Genocidal Studies. I have always been fascinated by History, but with no personal connection to the Holocaust and my own studies focusing on Latin American History, I knew it would be a challenge to help run a high school class on the subject. The staff at the center including Yedida, Morgan, Nikki, Alexis and Adrian created a nurturing and professional environment, taking the time to make sure I felt comfortable with the historical material. While I was excited for the opportunity to work with such an incredible organization, I had no idea just how rewarding this experience would be. On a day to day basis, I found myself engaging with some of the most patient, caring and dedicated individuals I have ever met amongst the small staff of the JFCS Holocaust Center. I enjoyed discussing our historical interests, and I was motivated by the wealth of talent and intelligence amongst them. Beyond creating a comfortable working environment, they fostered the teaching abilities of the other University Fellow, Zach, and myself. Together we created a lesson plan to help extend the students’ studies beyond the scope of the Holocaust to other genocides, and were able to personally add to the curriculum of the course. Even as a fellow, I felt that my input was valued and I felt a tremendous sense of accomplishment in not only completing our lesson plan, but also while participating in events that the center helps run like the annual Day of Learning as well as the Yom HaShoah event in the city. Looking back on my time as a fellow at the Holocaust Center, it has truly been one of the most rewarding experiences of my life. Through the Next Chapter program, I have had the pleasure of working with gifted high school students, engaging with them in intense historical and ethical debates. In particular I feel this experience will be an important part of my professional development as I pursue a career in education. I have also been able to hear firsthand the accounts of several Holocaust survivors who came in to share their stories with our class, and I will hold these accounts and experiences close to me for the rest of my life. I have been afforded access to an array of scholarly resources and primary documents through the Tauber Holocaust Library and the Archives, and having access to such fabulous sources every day I am at work has been such an interesting academic experience. Taking the position as a fellow at the JFCS Holocaust Center has proven to be one of the greatest decisions of my life, and this past year has been a journey that has taught me more than I ever could have ever imagined. For more information about the University Fellowship, please contact Yedida Kanfer, Manager of Library, Archives, and Education Services, at YedidaK@jfcs.org or 415-449-3748.